Please choose engraving design (photo 6) and/or engraving font (photo 7). If you have a different request, please send convo with attached graphic. Docking Station made out of real 100% SOLID WALNUT hardwood. Also available in Sapele Mahogany PREMIUM Hardwood. Universal design, Qi wireless charger ready, more features, and a smart design that gracefully upgrades as newer smartphones/plug adapters become available. 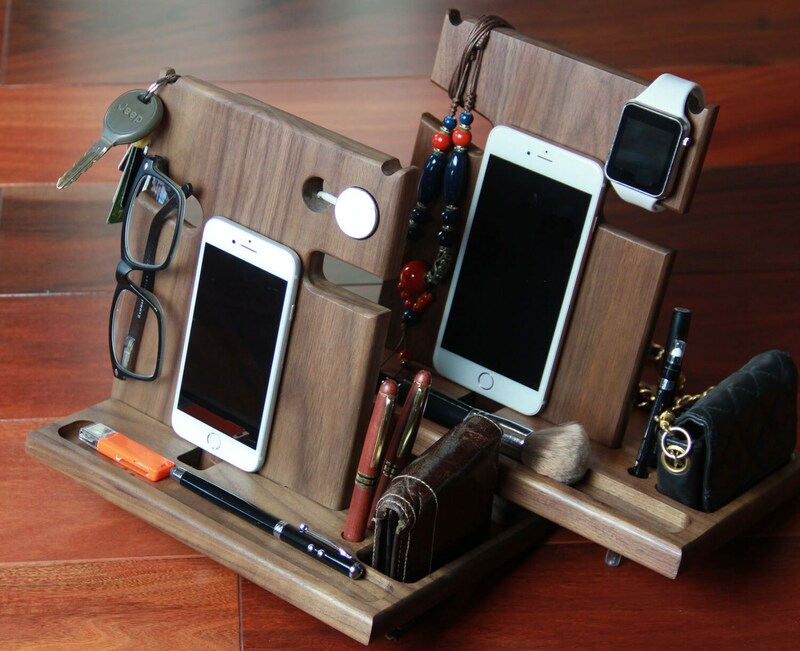 It's based on an age-old valet design with space for your iPhone, Android, iWatch, Fitbit, and tablet. When you get home these stations will keep you neatly organized – they house your electronic devices, wallet, watch, keys, pens, eyeglasses, sunglasses, jewelry, loose change, and an assortment of miscellaneous items living in your pocket - everything is ready for you to pick up when you go out the door. THIS LISTING IS FOR 1 DOCKING STATION. Take a close look at the listing PHOTOS 1-5 to see the variations, display storage capacity, engraving ideas, phone sizes, Apple watch dock option; PHOTOS 6-8 for engraving/ordering instructions; PHOTOS 9-10 for Additional-Add-Ons. Can usually ship NEXT DAY if ordered before 5 pm, 1-3 day Priority Mail. Ample room underneath to route wires and plenty of surface on top to mount your wireless charging base for your phone, tablet or phablet. I didn't want customers to pay extra for this feature or get stuck into a particular design that wouldn't support wireless charging - no feeble mount that slips or breaks, no tools, simplicity at its finest. I use this feature in my office, and it works great. You simply slide both pieces together – it’s that easy. The upright top is meant to support large tablets, store your mail and can even accommodate a heavy clipboard loaded with paper. Yet, it takes up very little space - not too big, not too small. It even collapses together into 2 equally-sized pieces convenient for travel - approximately 7" x 10" each piece and up to 1.5" thick when combined. It comes with ample storage in the front and hidden storage in the rear. Plenty of room for multiple devices and hidden raceways underneath to keep cords organized and exactly where you want them. No pinching, no binding. I designed this to charge 3 devices at the same time; 4 devices if you include the iWatch add-on. In the office, I use it to carry my headphones so I made the base port a little wider to accommodate passing the plug through the port without having to take the dock apart. The hidden storage space in the back is plenty wide with room for personal items and items you want to be kept from view. I tilted the left hanger to serve 2 purposes. 1) The main purpose is to keep some of my items like glasses a stable storage area and 2) an extra place for another watch. It also adds a more inventive and artistic look. I also do something unique by placing a magnet into the iWatch carriage that holds the iWatch charger in place (iWatch charger not included). This makes installing your iWatch charger tool-free, quick and super easy to install and remove. After you install your charger, I recommend "sliding" your iWatch off and on its carriage. More than anything I wanted to make this the perfect gift. I wanted the features to be plenty and make the most of real-world living. I use this myself and have them in key areas inside my home - bedroom, bathroom, kitchen, and here in my office. In each of these areas I use the docking station a little differently. I use my tablet in the kitchen a lot and use the one in my bathroom to charge all my devices. The one set up in my office stores all my mail, headphones, pens, scissors, lip balm, and a few other miscellaneous items. My husband has his in the bedroom and I love how it keeps our bedroom clean and organized. I can help you put together something you’ll be very happy with. Take a look at my online samples to give you an idea of what type of art works best for laser engraving. I can also send you a proof before I engrave your dock if you request it. You’ll also receive your docking station with retail packaging that includes a large photo of use and photographic/text instructions for assembly and maintenance. If I run out of stock it only takes me approximately 1-3 days to make my docking stations. Larger orders take more time so please send me a convo, and I can estimate a time to ship. I only ship to and from the USA. This helps me help you by keeping business predictable and consistent. I've had some local customers receive my docking stations as soon as the next day. I don't offer expedited shipping nor do I charge extra to expedite your order. All orders are expedited - in the order received. Currently compatible with all cell phone and watches on the market today. iPhone XS, iPhone XS Max, iPhone XR, iPhone X, iPhone 8, iPhone 8 Plus, iPhone 7, iPhone 7 Plus, iPhone 6s, iPhone 6s Plus, iPhone 6, iPhone 6 Plus, iPhone SE, iPhone 5s, iPhone 5c, iPhone 5, iPhone 4s, iPhone 4, iPad and iWatch. Samsung Galaxy Note, Samsung Galaxy Tab, Samsung Galaxy Smartphones and Fitbit smart watches, etc. Use my Fine Furniture Polish for best results. Made with 100% pure beeswax, food-safe mineral oil, and vitamin E.
All rights reserved. Please do not copy. All designs and photos are the property of © Tudor Sign Company™. Wonderfully beautiful docking station! Would do business with again ! The owner is so very kind and patient! Thank you again ! !